Taking the ferry over to Victoria is a popular day trip for tourists to Vancouver. And for some people, a ride on BC Ferries is inevitable, whether it is to attend school at UVic, visit family, or simply return home. In my case I was going over for a vacation, which also involved performing in a piano concert (click here for free recording of my performance in the concert). Naturally, during the 1.5 hour ferry trip, I got hungry. There are several food options available on BC Ferries, one of which is the Pacific Buffet, which BC Ferries describes as offering “elegant ocean-view dining on sailings from Vancouver to Victoria and features a wide selection of hot and cold items”. The buffet costs $16 to $21 depending on the time of day. The line up for the buffet seemed long, so I headed over to the main cafeteria, which is branded as “White Spot”, a popular chain restaurant with several locations in Vancouver. The ocean-going version of White Spot has a simpler menu, but still has some attractive choices, such as the Roast Chicken with fries or Caesar salad, various burgers, salads, or their signature entree, the baked maple-glazed salmon ($11.99, pictured below). The salmon was surprisingly good, and unlike some restaurants where the actual product looks a lot different from the picture in the menu, my salmon looked very similar to the enticing poster-sized photograph at the cafeteria entrance. 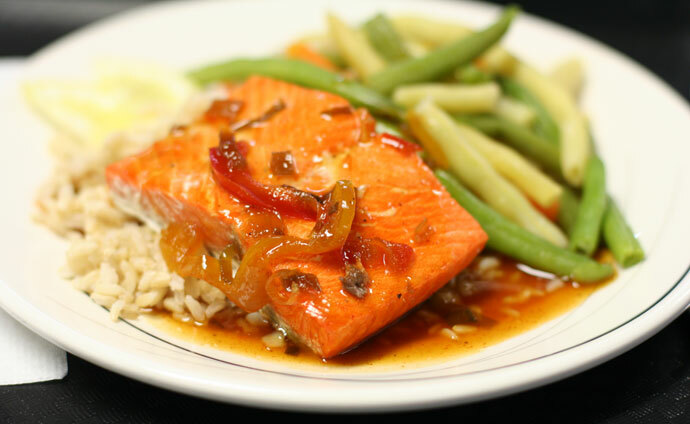 My only problem was that I was really hungry, and I could have easily eaten two orders of scrumptious salmon. Maybe next time I’ll try the Pacific Buffet! 15,167 views. This entry was posted on Sunday, July 13th, 2008 at 12:23 am	and is filed under All You Can Eat, American, Casual, Chain Restaurants, Chicken, Fast Food, Food Photos, Healthy Food, Large Groups, Lunch, Reasonably Priced, Restaurant, Seafood, Tourist Attraction, Vancouver, Vancouver Restaurants, Victoria, View, Waterfront. You can follow any responses to this entry through the RSS 2.0 feed. You can skip to the end and leave a response. Pinging is currently not allowed. Unfortunately I do not work for BC Ferries and cannot forward your message to them. I suggest you talk directly to BC Ferries Customer Service by calling them or sending them a letter by postal mail. I was on the 7pm Ferry from Victoria to Twsassen Saturday April 7th 2012. I had one of the veggie burgers from the White Spot on the Ferry. A couple of hours later I was very ill with food poisoning. Seeing as how it was the only item I had eaten in many hours I am certain the veggie burger was in fact contaminated. I am currently seven and a half months pregnant. As you can imagine I am very unhappy with this situation and am still slowly recovering. This happened Saturday night and it is now Tuesday evening and I am still ill. There was only one girl working at the time that I could see. I understand that sometimes we are forced to be understaffed but please understand that this can pose great risk and if staff is not trained properly in food safety others can get seriously ill. I hope you take this matter very seriously.